Russian Economy Minister Ulyukayev charged with bribery | Russian Legal Information Agency (RAPSI). 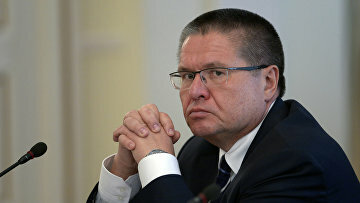 MOSCOW, November 15 (RAPSI, Diana Gutsul) – Russian Economy Minister Alexey Ulyukayev was officially charged with bribery conducted in especially large amount and with the use of extortion, acting spokeswoman for the Investigative Committee Svetlana Petrenko told journalists on Tuesday. According to Petrenko, Ulyukayev demanded Russian state-controlled oil giant Rosneft’s representative to pay him a bribe for lawfully providing a positive review and evaluation of a deal that allowed Rosneft to acquire government’s share in mid-sized producer Bashneft. She added that Ulyukayev threatened to create obtrusions for Rosneft with use of his position. Investigators ask a court to put minister under house arrest. Earlier, investigators have said that a criminal case against Ulyukayev was launched on November 15. Presidential spokesperson Dmitry Peskov told RIA Novosti that Vladimir Putin was informed when the investigation was launched. However, he failed to answer the question whether the situation with Ulyukayev can affect Bashneft deal. Bashneft was controlled by the government of Russia’s Bashkortostan region until 2003, when a major stake was sold to companies affiliated with Ural Rakhimov, son of the former head of Bashkortostan Murtaza Rakhimov. The company was privatized in 2009 when Russian oil-to-telecoms conglomerate AFK Sistema gained control of it. Investigators opened a criminal case in April linked to deals with Bashneft shares in 2002 to 2009. Rakhimov and billionaire Vladimir Yevtushenkov were implicated in the sale of Bashneft stock in 2009. Rakhimov was charged in absentia with embezzlement and money laundering, put on the international wanted list. The Moscow Commercial Court granted in October 2014 a claim which had been filed by the Investigative Committee and ordered AFK Sistema, its subsidiary Sistema-Invest to forfeit Bashneft stock.